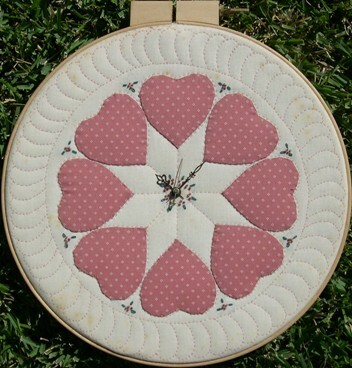 I used to make these quilted heart clocks back in the 80's. I can remember making at least three. I think this was the first one. Later I appliquéd twelve hearts and included the numbers. I had made one for my daughter Jill and hung it in her room. When guests stayed in her room they would always take the clock out of the room because the tick-tock bothered them. I guess we have gotten used to the quiet of digital clocks.